Comfort and fit are two important aspects of boat seating. Every boat is set up different and getting one application that works for all is difficult. 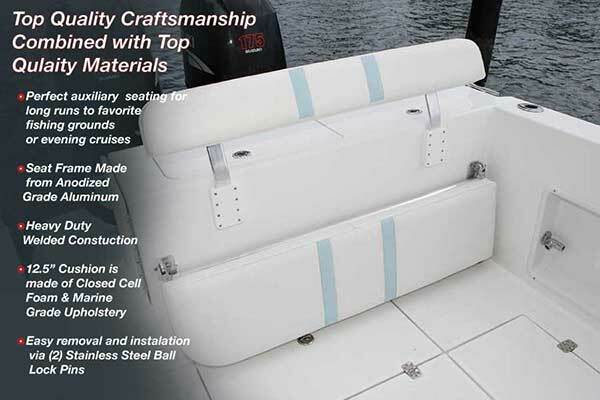 Birdsall Marine has designed a transom mounted folding rear seat that can be adapted to work with most small fishing boats. Providing needed seating with out compromising space or cost. Along with the rear seats we offer folding back rests with many types of mounting styles, from varies degree rod holder applications, to top mount and pocket mount arms. Adding a back rest to your existing leaning post or transom has never been easier. Forward seating is also available on request. All seats and backrest are made with the highest quality materials using anodized aluminum pipe, marine grade fabrics and closed cell foam. Forward Seating Adjustable Backrest "Pair"